Aboard Un-Cruise Adventures upscale Safari yachts, travellers are provided with all the amenities and services they need in the unique land and sea scapes of Southern Alaska. 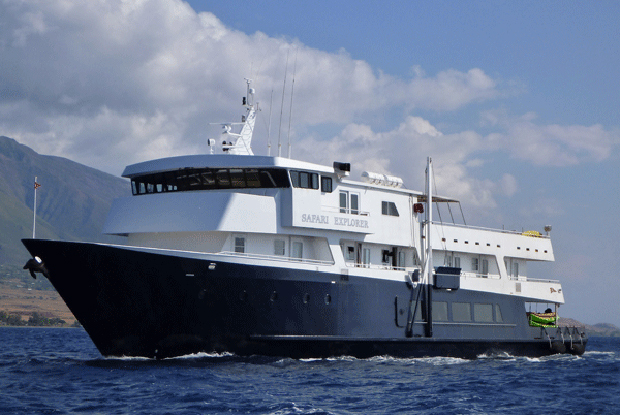 Their vessels come with all the equipment needed to maximise their passengers experiences such as “zodiacs”, kayaks, paddle boards snorkelling gear and wet suits etc Take a hot tub and a glass of champagne, wine or beer- nothing too strenuous or extreme. Personal comfort is assured with full bathrooms with en suite showers some with heated floors and jacuzzi tubs. What makes these cruises special is that they are all inclusive with no extra charges for port fees and taxes, the use of any equipment, frequent and more exclusive excursions, indulgent on board relaxing, gourmet cuisine and fine dining including all wines, spirits and micro brews. Day 1: Juneau, Alaska – Embarkation | Arriving in Juneau, you will be transferred from the airport. Upon boarding, your crew greets you with champagne and smiles as you set sail. 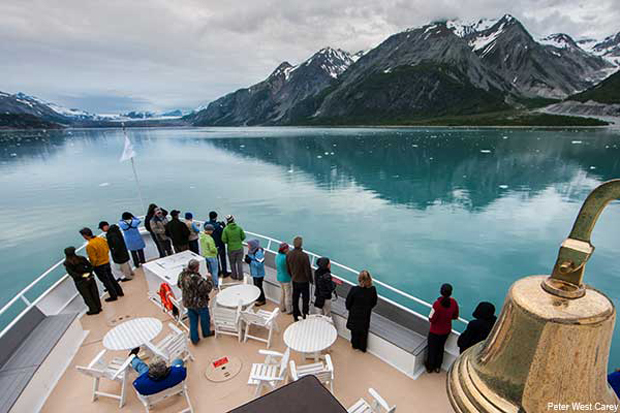 Day 2-3: Glacier Bay National Park | Accompanied by a National Park Ranger, over the two days in the park you’ll travel nearly 60 miles cruising up-bay to the tidewater glaciers of Grand Pacific and Margerie, which frequently calve huge icebergs into the bay. Enjoy evenings at anchor in hidden coves, and mornings paddling your kayak. Here in the bay there are puffins and sea lions, mountain goats and bears, moose, eagles, and scenery more spectacular than any place on earth. Day 4: Icy Strait | Set your course for arguably the richest whale waters in Southeast Alaska. Keep watch for the telltale blow of the humpbacks as you scour the nutrient-rich waters in search of whales, porpoise, sea lions, and other wildlife. Join the Captain on the bridge or go on deck with your Expedition Leader. Late afternoon, drop the skiffs and kayaks for closer inspection of the remote coastline with eyes set on shore for possible bear sightings. Day 5: Chichagof Island / Baranof Island | Cruise along the waterfall coast of Chichagof Island. Marvel at the grand scenery of Alaska’s wilderness as the crew expertly guides you through those “not in the guide book” places known only to the locals. This evening, perhaps tucking away in a waterfall-laced fjord, there’ll be time for skiffing, beachcombing or treks ashore, and kayaking to look for sea otters and bears before calling it a day near Baranof Island. Day 6: Frederick Sound / Stephen’s Passage | Spend the day exploring the serene Frederick Sound and peaceful Stephen’s Passage—another excellent chance to view humpback whales. Pass by Five Fingers Lighthouse and a large sea lions haulout made from dozens of rocky islets. Day 7: Ford’s Terror / Endicott Arm | Cliff-walled fjords sliced into the mountainous mainland are widely acclaimed as the most beautiful in the whole state. Explore this majestic Fjord Terror by kayak or skiff. View rugged icecovered mountains gleaming high overhead and a glacier that actively calves into the ice-filled fjord of Endicott Arm. Toast your voyage with a festive Farewell Dinner. Day 8: Juneau – Disembark | Gather for breakfast before returning to historic Juneau. A transfer to the Juneau airport or the Baranof Hotel is included. ●● All adventure activities, hot tub sauna*, yoga*, complimentary massage (*except Safari Quest).